Villama�ez Hostel is situated in a privileged cultural area of Madrid, very close to important museums of the capital, like Reina Sof�a Museum, Prado or Thyssen. 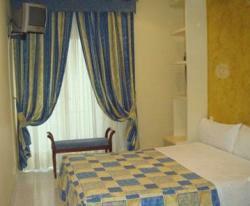 Puerta del Sol, Puerta de Alcal�, Cibeles or Neptuno are also very close to this guesthouse. It offers TV in the rooms, pay with credit card, heating and reception. The prices are perfect if you don�t want to spend a lot of money and to enjoy the life of Madrid, and also the friendly and cozy atmosphere. If you want to move through the city, you could take the subway nearby in Ant�n Mart�n or Banco de Espa�a. 20 beds, 10 rooms, 1 floors.